Heroin use in DuPage and other nearby counties has increased at an explosive pace in the past five years. 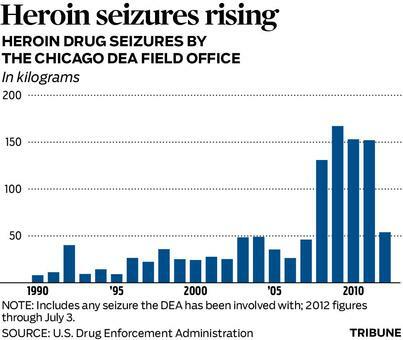 The (Tribune) chart to the left indicates an alarming growth trend; heroin is increasingly more available in the Chicago area. Because it is cheap and readily available, teen heroin use is also on the rise. A quick glance at Devin Reed’s piercing green eyes and bright smile could never reveal that the 25-year-old from Hoffman Estates was a heroin addict. Now sober, Reed is sharing his story with parents this week during seminars at Hersey and Fremd high schools. “In my mind I was going to go on (using heroin) until I passed away, and I became really OK with it, really quick,” he said.